Bangkok is known to many as the shopping haven in Asia, and if you like affordable and stylish clothes, bags and accessories, then this city will bring you so much happiness. Thai are a lot like Pinoys -- they also like street food! Thanks to the many malls we went to, we averaged 15,000 steps a day! This one's Isetan -- just one of the malls located in Central World, a popular shopping district in BKK. The city is also a home to several temples and shrines -- like this one in Bang Pa-In Palace where we learned more about Thailand's culture and history during our one-day tour in Ayyuthaya. Tip #1: Change your peso to baht in Manila. If baht is not available, then change it to dollars at the very least while you're still in Manila. Then when you arrive in Bangkok, scout for the best exchange rate so you get maximum value for your money. 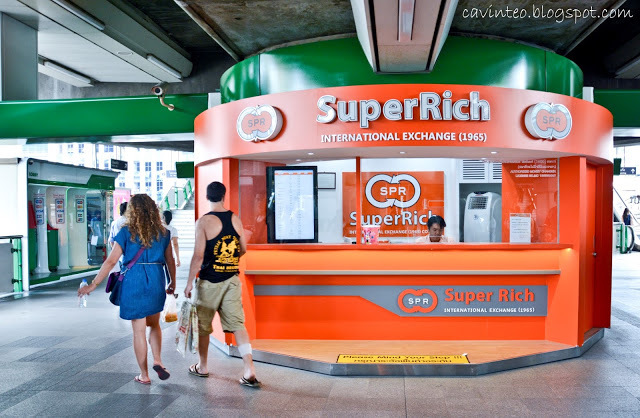 I hear that SuperRich gives the best exchange rates so be sure to check this one out. We booked our hotel a month before our trip through Agoda. There are several hotel engine sites available nowadays like Asia Travel and trivago, to name a few, and then there's also Airbnb. Since we are 2 ladies traveling in a foreign country, I figured it would be safer and more convenient to book a hotel instead of a place in Airbnb. Plus, that way, we were sure that they provide towels (less baggage), water and daily housekeeping. We stayed in Nantra Sukhumvit 39, for P500 pesos per person per night. Our hotel is right at the back of the train station. They're also beside a mall and they are in a pretty busy neighborhood with spas, restaurants and convenience stores within walking distance from each other. So it's convenient and they also serve breakfast everyday. Although don't expect breakfast for champs complete with rice, eggs and viands because they only have bread, cereals, coffee and fruits. Works for us though! So for the 4 days that we were there, our breakfast was free! Yaaay! For that price, not bad at all. Google Maps is a lifesaver! Since I am so prone to getting lost (I can hear my friends saying amen now), I really need a navigating tool in my life. When we got there, we rode uber to get from the airport to the hotel which was steeply priced because it was 30 minutes away. When we got to the hotel, I opened google maps and planned how to get to the places that we wanted to go to. Just like Hongkong and Singapore, Bangkok has railways and trains and I appreciate how we were able to navigate the city with ease. There were just muntik-na-mawala moments (muntik being the operative word :P) but it's tourist friendly as a country. Another thing that you need to know about Bangkok is that they are not wi-fi generous. I mean you need to register before you can have wifi access outside, and after you register, you're usually allowed only 1-2 hours of connection. So what we do before we leave the hotel is that we make sure that we have screenshots of google map directions on our phone to get us through our activities for the day. And when we get to the hotel, that's the only time we can go online and post on social media. If you're traveling as a group, you may want to consider buying a pocket wifi when you arrive in Bangkok to ensure that you're connected most of the time and you are able to post real time on your social media accounts. 5. Need a Tour Guide? For the tourist spots in the city, we booked a one-day tour at Viator. Since every country has a unique background and history, it would be good to have at least a day to get acquainted with its culture. It was my first time to use Viator since we usually book an agency or plan our own itinerary but if you're looking for a tour group complete with hotel transfers, tour guide and meal inclusions, then hop on over to Viator because they have so many packages that would suit your budget and your interests. Just make sure to book this one in advance to make sure you get your slots! PS.Next posts will be on the country's food and sights!